Eating disorders (EDs) have become a social epidemic in the developed world. This book addresses the close links between EDs and exercise, helping us to understand why people with EDs often exercise to excessive and potentially harmful levels. This is also the first book to examine this issue from an ethical and legal perspective, identifying the rights and responsibilities of people with EDs, their families and the fitness professionals and clinicians that work with them. The book offers an accessible account of EDs and closely examines the concept of addiction. 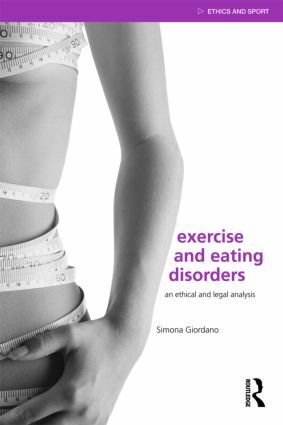 Drawing on a wide range of medical, psychological, physiological, sociological and philosophical sources, the book examines the benefits and risks of exercise for the ED population, explores the links between EDs and other abuses of the body in the sports environment and addresses the issue of athletes with disordered eating behaviour. Importantly, the book also surveys current legislation and professional codes of conduct that guide the work of fitness professionals and clinicians in this area and presents a clear and thorough set of case histories and action points to help professionals better understand, and care for, their clients with EDs. Exercise and Eating Disorders is important reading for students of applied ethics, medical ethics and the ethics of sport, as well as for fitness professionals, psychiatrists, clinical psychologists, sports coaches and sport and exercise scientists looking to improve their understanding of this important issue.